As you are a Platinum Partner, you are entitled to car servicing discounts of up to 50% off retail prices! What can I enjoy with 50% discount? 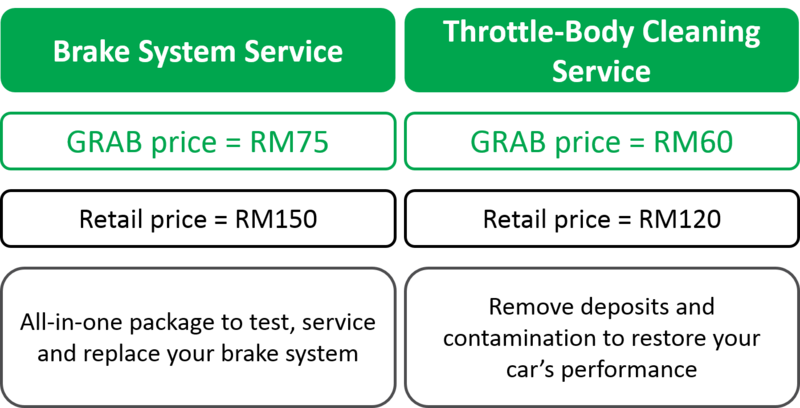 Prices shown above are for Proton/Perodua. Surcharges may apply for other car brands and models. More Grab Auto discounts available to you! JS Auto and DTOX, our trusted partners also offer a wide range of car maintenance services at discounted rates, their most popular services being engine oil change & tyre change. *You are automatically entitled to all discounts under Grab Auto rewards if you have been selected as our Platinum Partner. Receive the Platinum Partner eligibility SMS from Grab. Drive to any outlet listed below. Flash your SMS and Grab Driver App. To avoid long waiting times, call your selected outlet to check for availability. When does this rewards programme start? You can start enjoying your rewards starting on the first day until the end of the month. There is no limit to the number of times you can claim the reward in the month. Where can I go to redeem this reward? Rewards programme is applicable to selected as Platinum Partners who received the eligibIlity SMS. All details stated above pertaining to this programme may be subject to change without prior notice.